An ongoing clash in their common constituency spilled over to the Cabinet on Wednesday and it required the intervention of President Maithripala Sirisena. He directed that the appointment of a Director of Sports be rescinded and a fresh appointment be made. Initiating the appointment was Education Minister Akila Viraj Kariyawasam. His colleague Sports Minister Dayasiri Jayasekera – both from opposite parties in the Kurunegala district — was infuriated that the appointment was that of an “outsider” when the requirement was that the post should go to a senior administrative level officer from the education service. Though not a relative, the new director bore the name of the Minister. Minister Kariyawasam said the appointee was a qualified karate expert well versed in sports. Arguments reached a crescendo with Minister Jayasekera alleging that the new recruit was a supporter of the United National Party (UNP). President Sirisena intervened and directed that the appointment be rescinded. He said he would discuss the matter further with Prime Minister Ranil Wickremesinghe. There was also a publicly unknown revelation that surfaced as a result of the tussle between the two ministers. The Provincial Governor had her son doubling up as her Private Secretary as well. The same son was a member of the Provincial Council that the Governor in question presided over. Some cabinet ministers pointed out that the blatant conflict of interest was one thing. Worse, they claimed, was that the son was running the council through the mother. There was also a debate of sorts at the same ministerial meeting when it came to the award of a tender for Duty-Free shops at the Bandaranaike International Airport (BIA). Both Finance Minister Ravi Karunanayake and Foreign Minister Mangala Samaraweera raised issue over the current Duty Free shop licensee being overlooked though he had operated for the past 25 years. Transport and Civil Aviation Minister Nimal Siripala de Silva insisted that the selection of a successful tenderer had been made after due process and he was not going to change it. He charged that former President Mahinda Rajapaksa had issued licences to operators of duty free shops without considering any criteria. It was agreed that Minister de Silva should make a final decision. Chief Guest Speaker Karu Jayasuriya is seated. The guest of honour, whose seat was next to him, remains vacant. Thousands of Sri Lankans watched live on television the March 8 Parliament fracas that saw the suspension of ‘Joint Opposition’ leader Dinesh Gunawardena. Speaker Karu Jayasuriya originally wanted to suspend him for ‘unruly behaviour’ for just that day, but eventually barred him for a week on a motion moved by the UNP when Mr Gunawardena continued to defy the Speaker’s order to sit. 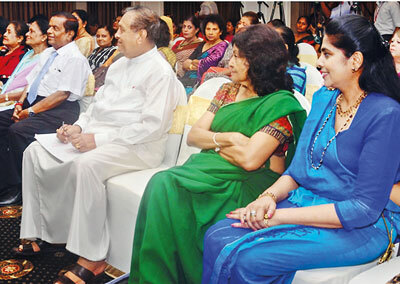 That same evening, the two gentlemen, Speaker Jayasuriya and MP Gunawardene were the chief guest and the guest of honour respectively at an International Women’s Day event at Kingsbury Hotel. Ironically, Yadamini Gunawardena, the ‘Joint Opposition’ parliamentary leader’s son had rung the organisers of the event earlier that day. He had checked whether “Mr Karu Jayasuriya is coming?” (for the event). Later, even an advance security team of Mr Gunawardena had arrived at the hotel. In Parliament, pandemonium reigned. The Karu Jayasuriya-Dinesh Gunawardene dispute was big news on all news channels. But the women at the event were oblivious to what was happening in the august assembly; they were more interested in their own assembly-to-be. Having sent Gunawardene packing home, a relaxed Jayasuriya turned up at Kingsbury Hotel and told the main organiser of the event “I had to suspend your guest of honour”. There was no show by the ‘Joint Opposition’ leader who was busy holding news conferences condemning his ouster from the House, but disappointing the event organisers. It was therefore a near ‘one man show’ at Kingsbury Hotel with Speaker Jayasuriya remarking he has never before been surrounded by so many lovely ladies. Meanwhile, Mr. Gunawardene is due to make his ‘debut’ in Parliament once again on Tuesday. Financial Crimes Investigation Division (FCID) officers who probed the 16 bank accounts of Udayanga Weeratunga, the onetime Sri Lanka Ambassador to Russia, have made further findings. Detectives say they have uncovered details of foreign remittances in these accounts and they included those from offshore accounts in two countries. Among the banks from which such remittances have arrived into the accounts were those from Latvia and Hong Kong. Colombo’s Chief Magistrate Lanka Jayaratne has directed that Mr Weeratunga’s Sri Lanka bank accounts be frozen. The move follows an application to Court by the FCID, giving details of the account numbers and the balances remaining in each one of them. A move by the newly established car assembly plant in Kurunegala to obtain duty free concessions has failed. The assembly plant, once touted as a factory to assemble Volkswagen cars, wanted a string of duty concessions. A ministerial source said those concessions would have not only deprived revenue to the state but placed the assembly plant at an advantage over others. Whilst the Cabinet of Ministers has decided that “action need not be pursued for the time being,” but a Cabinet Sub Committee should be appointed to probe the entire issue of duty concessions. The subcommittee will be headed by Transport and Civil Aviation Minister Nimal Siripala de Silva and include Sarath Amunugama, Anura Priyadarshana Yapa, Ravi Karunanayake and Patali Champika Ranawaka. The 17-acre land in a picturesque area adjoining the Kelani River at Gangaboda Road in Malwana — disowned by former Minister Basil Rajapaksa — will not be sold after all. Instead, the Cabinet of Ministers decided last Tuesday that the land should be taken over. A Cabinet memorandum for the purpose was submitted by Justice Minister Wijeyadasa Rajapakshe. He claimed that the Government Valuer had estimated the value of the land at more than Rs. 208 million. He claimed that this value was not realistic. Law and Order and Public Safety Minister Sagala Ratnayake then proposed that the land be set apart for a Police Academy. However, no decision was made on the matter. The Attorney General’s Department is to now move the Pugoda Magistrate’s Court for the cancellation of the court order to sell the land by public auction. It will cite the decision by the Cabinet of Ministers. During FCID investigations, it was alleged that the land belonged to former Economic Development Minister Basil Rajapaksa. However, he had disowned the land, thus making the property one that had no owner. Hence the move to auction it. Advertisements placed in the media for the sale are to be invalidated through another notification. It will announce the cancellation of the sale. The Sri Lanka Coast Guard (SLCG) wants the Colombo Dockyard to construct three Offshore Patrol Vessels (OPVs) at a cost of US$ 180 million. President Maithripala Sirisena, as Minister of Defence, has sought the approval of the Cabinet of Ministers for this purpose. He has said that the Coast Guard is entrusted with carrying out patrolling in maritime waters — about 517,000 square kilometres of sea around Sri Lanka. The Coast Guards conduct search and rescue, enforce law and order in coastal areas, territorial waters and the maritime zone of Sri Lanka’s high seas, he has pointed out.